ABOVE: Liam Jurrah (3rd from right) with family at the noon break. AT RIGHT: Witness Bruno Wilson. BOTTOM: Police intervened as tempers flared outside the court on several occasions. A witness in the Liam Jurrah trial has told the court that he lied in a statement to police when he said that Liam Jurrah had a nulla nulla and that he hit Basil Jurrah with it three times. He said that he lied because he felt under pressure; that the police officer repeatedly asked him whether Liam Jurrah had a weapon and only stopped when he finally said that he did. He said he at first told the officer that Liam Jurrah did not have a weapon. As this unfolded in court, the public gallery filled with many more people than there have been to date. There was consistent murmuring and whispering in the gallery. The court broke for half an hour (to allow lawyers to prepare their next move). As people, including media, walked out for some fresh air, shouting broke out on the lawns opposite. At the foot of the stairs, two young men exchanged punches. A large contingent of police officers were rapidly on the scene and crossed the road to calm things down. 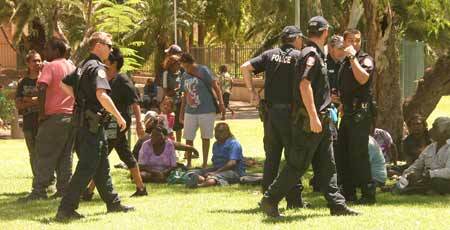 The Alice Springs News spoke to a group of women who were in the crowd and then withdrew to sit under a tree nearby. They said the trouble started when a young man from the Granites family said something to upset people. It was related to the four-year-long family feud at Yuendumu, they said. But people, including them, had also gathered because this afternoon the preliminary examination of a man accused of murder begins, a separate matter from the Liam Jurrah trial but apparently affecting some of the same people. Inside the court the interest was focussed on the evidence of 23-year-old Bruno Wilson (pictured). He lives at Yuendumu but on March 7 last year was in town at Old Timers camp, at the home of his wife. He said he was drinking there with “family from the Visitors Camp” (across the road from Old Timers). He named Christopher Walker, Josiah Fry, Liam Jurrah and Dennis Nelson as his companions. A woman in a red car arrived to tell them that there was a fight at Little Sisters and that family members were needed. He went there “because it was my wife’s family”, he said. There were about 12 to 15 people in his group. They could see people gathered “getting ready for a fight”. They were about 20 metres away. He said they were armed. He said Basil Jurrah had a machete; Lindsay Williams, an axe; Lemiah Woods, a nulla nulla; and Allan Collins, a big stick. Asked whether anyone in his group was carrying anything, he said no. However he lated gave evidence that Christopher Walker was armed when he was in the back yard of House One. Initially he said Mr Walker was punching Basil Jurrah but he went on to give a graphic description of Mr Walker smashing “all his front teeth out” with the handle of an axe. He said that before this he himself had jumped on Basil Jurrah, trying to block others from hitting him. He said Liam Jurrah was close to the group during the attack on Basil Jurrah but he had nothing in his hands and did not do anything to him. Everyone was talking at the same time; he could not remember anything that was said. Crown prosecutor Stephen Robson went on to cross-examine Mr Wilson, having been given leave to do so by Chief Justice Trevor Riley. He showed him his police statement which was inconsistent with the evidence given this morning in court. Mr Robson put to Mr Wilson that he was lying now because he didn’t want to get Liam Jurrah into trouble. Mr Wilson stuck to his guns. He said the police officer kept referring to Liam. The statement was taken when Mr Wilson was at the “Correctional Centre”. He said the police officer said it was about “three fellas”, naming Christopher Walker, Josiah Fry, Liam Jurrah; that he had evidence from other witnesses. He said he felt that he had no choice as the police officer said other witnesses had seen what was going on. Mr Wilson was in gaol having been picked up on warrant, for non-appearance in court on a drink driving charge. “You’re not suggesting the police officer offered you any favours , are you?” asked Mr Robson. “No,” said Mr Wilson. Jon Tippet QC for Liam Jurrah, cross-examining, took this situation further. To his questions, Mr Wilson agreed that he was questioned alone, with no recording equipment, and it lasted for over an hour. “So he kept asking you questions over and over again until you said something?” “That’s right,” said Mr Wilson. To Mr Tippets’s further questioning, Mr Wilson said he had never spoken to Liam Jurrah about the case, nor Liam Jurrah to him and that he is not related to Liam Jurrah. Further, in relation to the family troubles, his position is that he stays away because he is “neutral”, Mr Tippet said, to which Mr Wilson said, “Correct”. Could agree more “Fed UP” these people have no respect or consideration for the people of this town. Fights in the shopping centres, in front of the court house, in our suburbs … not safe any more in the parks as they are sleeping in them now and leaving their empty grog containers there for someone else to pick up, even on the streets – or just chuck it over the fence in someone’s yard. 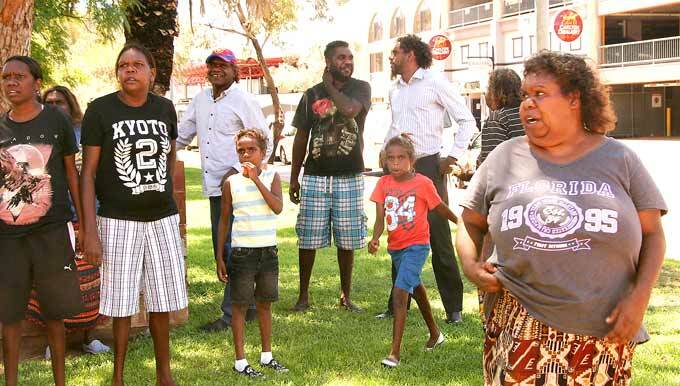 For goodness sakes – you mob are going to court for fighting and wanting to kill each other and there you go again, this time in front of the court house! Have you no respect for the law at all or for the people who have to witness this crap all the time. Go back to your own country and do this, don’t come to my home town and put all of us “blackfellas” in the same category as you mob. No wonder the “whitbellas” are leaving Alice in droves … they are even more sick of you mob! Go Home!